In January of 2011, LinkedIn finally released its revamped ad platform titled LinkedIn Ads. Since January, I’ve been helping several clients build and launch campaigns that leverage the unique targeting capabilities that LinkedIn provides. For example, you can target by geography, industry, company, job title, LinkedIn group, etc. Based on this level of targeting, I’ve run some extremely successful campaigns for my clients. Actually, I’ve seen the performance of some campaigns compare to their equivalent Search-based campaigns (run via AdWords and adCenter). And, when you think about the intent differences between Search and a platform like LinkedIn, having comparable conversion rates for certain campaigns is impressive. When launching LinkedIn campaigns for clients, I find some clients immediately fire up Google Analytics to check when traffic begins hitting the site. This is the point when some confusion can set in, based on a feature that LinkedIn provides in its Ads platform. The feature isn’t so obvious to find, and it can be easily overlooked, so I understand why there’s confusion. And, overlooking this feature can lead to an awkward situation, depending on the nature of the campaign being launched. I cover this feature in detail below, along with how to adjust this setting. Here Come The Clicks, But From Where? When new LinkedIn campaigns started driving traffic, the resulting visits sometime hit so quickly that I was a little skeptical. For example, seeing the first set of visits only minutes after the ads were approved. So I quickly drilled into the reporting and dimensioned that campaign traffic by Service Provider. This will often show you the companies that are visiting your site (depending on where the visitor is accessing LinkedIn from). Once I did this and presented the data to my clients, they immediately noticed a link between the companies initially hitting the site and their own connections on LinkedIn (the people they are professionally connected with on LinkedIn). Targeting-wise, the options we chose for the specific campaigns would not have included most of those connections, so we knew something was off. By the way, this also happened to me with my own campaigns. I was running some LinkedIn campaigns recently for my own business where I saw people clicking through that ended up being connections of mine. Again, this prompted me to dig deeper. How Were LinkedIn Connections Seeing The Ads? So, how were LinkedIn connections viewing and then clicking through new ads? Well, the answer lies in a small piece of functionality that’s located in a tab in LinkedIn Ads. It ends up connections were seeing each new LinkedIn campaign as network updates (which are broadcast to LinkedIn connections upon campaign approval). This would be similar to you posting an update from your LinkedIn homepage. It hits your news stream, which is pushed to your connections. John Smith started a new advertising campaign with LinkedIn Ads. Targeting 158 professionals by Company, Geography, and Group. Should This Information Be Broadcast? When this happens, your connections on LinkedIn can freely view your new ad and then click that ad to check out your landing page (or wherever you were sending LinkedIn campaign traffic.) Note, you are not charged for these clicks, and I’ll explain more about this shortly. But even if you aren’t charged, is this ok to do? 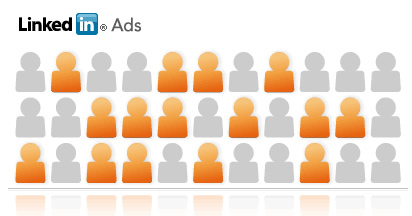 Do you want to broadcast your new ads, along with the targeting you chose, to all of your connections? How well do you know all of your connections, and are some actually competitors? These are exactly the types of questions that started coming up as I understood what was happening. Some clients had no problem with broadcasting their new ads, while others were upset that it was happening. The reaction I witnessed completely depended on the nature of the campaign. For example, if you were selling your core products or services, then getting extra impressions and clicks for free was fine. Actually, it could help a company gain more exposure (and quickly). But, if you were launching a new service that you would rather not broadcast to your connections (some of whom may be in the same industry), then you might not be thrilled to know they were seeing your ads (and targeting) and then clicking through to your landing page… Let’s face it, many people have connections on LinkedIn that might actually be competitors. They might be friendly competitors, but they are still the competition. As of today, if you check out the help section of LinkedIn Ads, you won’t find any reference to this functionality (at least I couldn’t). That includes information about what it is, how to turn it off, or even what it’s called. So, why would LinkedIn be broadcasting your new ads to your connections as network updates, while not referencing the option directly in their help area? Was this simply overlooked by the Ads Team at LinkedIn? I don’t think so. I think it comes down to exposure and revenue… The more exposure LinkedIn Ads get, the more people might try those ads. The more people that try those ads, the more money LinkedIn makes. And believe me, I get it, but I’m not sure LinkedIn should simply be running your ads in front of your connections without explicit approval. Instead, you are opted in by default when you launch a campaign, and must turn off the functionality yourself (if you find the option). I think that’s the wrong approach. To clarify, if this was documented the way it should be, then I think it’s a smart way to drive more awareness about LinkedIn Ads. For example, I see my connection John is running ads, I like the idea of trying that, let me find out more about those ads, and then I might spend money on running a campaign. That’s smart, but people shouldn’t be forced into doing this… LinkedIn benefits greatly from broadcasting your ads, while some advertisers don’t benefit at all. Actually, some of them can be hurt when this happens (again, since some connections might be competitors). Based on this happening, and not initially understanding how to adjust the settings, I contacted LinkedIn Ads support about the problem. To its credit, LinkedIn got back to me the same day and explained how to turn off that feature. 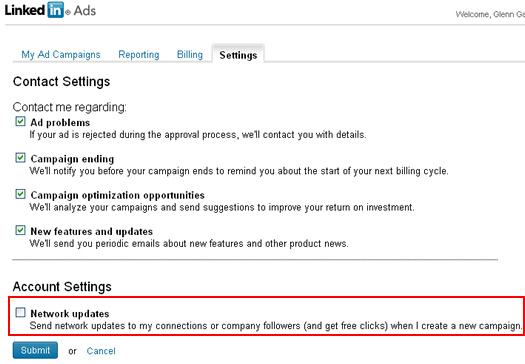 Again, this is not documented in the help section of LinkedIn Ads, and my hope is that it is included at some point soon… To me, advertisers should know that their ads are automatically going to be broadcast to their connections (along with the targeting options they choose), and they should have the option of turning off the feature. Again, I actually think this feature should be turned off by default. Based on what I explained so far in this post, I thought it would be a good idea to show you how to find this feature, and then how to turn it off (if needed). It’s straight-forward, and would actually be better off as part of the campaign building process (as a checkbox before you submit your ads). Unfortunately, it’s not, which is why I’m writing this post. 4. Click Submit and You’re All Set. Glenn, good hunting. It looks like a great tool to drive traffic to your site or promotion. Glad you were able to find out how to turn that sucker off though. Thanks Seth. I’m a big fan of LinkedIn Ads, but they definitely need to revisit their opt-in policy. I’m finding most advertisers have no idea that their new ads will be broadcast to their connections… You shouldn’t be opted-in by default. Glenn, thanks for calling out this network update feature – we’ve been using LinkedIn ads increasingly for B2B clients and we want to test in stealth mode, so glad I caught your post. Thanks Tom. I’m glad you found my post too. I’m not a big fan of how they layer that option deep in the settings… There’s a big upside for LinkedIn, but not necessarily for the advertiser. Glenn, thank you so much – I have been scouring the Internet for information on this but I have not found anything – so good to hear someone else is of the same opinion. I think it is really cheeky of LinkedIn to do this as it pushes private marketing/targeting information out about your company without you agreeing to it. Could I just follow-up with another question? We have had a similar problem where a third party were creating the ads for us, used our company name (they are not administrators of our company page) so when they ran the ad, in our company page, in the ‘Company Activity on LinkedIn’ – the details of our ads are displayed. Do you know how to remove these? If we change the setting as per you instruction, this will stop further ad creation being broadcast – what about updates for ads which are already out there? Any help you could provide would be great.. Thanks Ray, I’m glad my post was helpful. Regarding the company activity situation, I’ll have to check that out in greater detail. Just to clarify, did you uncheck the network updates option before the agency ran your campaign?